Definition: The Training Process comprises of a series of steps that needs to be followed systematically to have an efficient training programme. The Training is a systematic activity performed to modify the skills, attitudes and the behavior of an employee to perform a particular job. Needs assessment: The first step in the training process is to assess the need for training the employees. The need for training could be identified through a diagnosis of present and future challenges and through a gap between the employee’s actual performance and the standard performance. The needs assessment can be studied from two perspectives: Individual and group. The individual training is designed to enhance the individual’s efficiency when not performing adequately. And whereas the group training is intended to inculcate the new changes in the employees due to a change in the organization’s strategy. Deriving Instructional Objectives: Once the needs are identified, the objectives for which the training is to be conducted are established. The objectives could be based on the gaps seen in the training programmes conducted earlier and the skill sets developed by the employees. Designing Training Programme: The next step is to design the training programme in line with the set objectives. Every training programme encompasses certain issues such as: Who are the trainees? Who are the trainers? What methods are to be used for the training? What will be the level of training? etc.Also, the comprehensive action plan is designed that includes the training content, material, learning theories, instructional design, and the other training requisites. 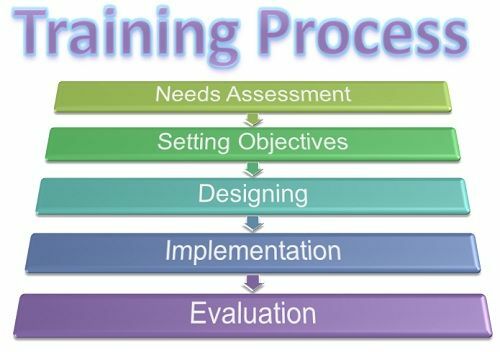 Implementation of the Training Programme: Once the designing of the training programme is completed, the next step is to put it into the action. The foremost decision that needs to be made is where the training will be conducted either in-house or outside the organization. Once it is decided, the time for the training is set along with the trainer who will be conducting the training session. Also, the trainees are monitored continuously throughout the training programme to see if it’s effective and is able to retain the employee’s interest. Evaluation of the Training Programme: After the training is done, the employees are asked to give their feedback on the training session and whether they felt useful or not. Through feedback, an organization can determine the weak spots if any, and can rectify it in the next session.The evaluation of the training programme is a must because companies invest huge amounts in these sessions and must know it’s effectiveness in terms of money. Thus, every firm follows the series of steps to design an effective training programme that serves the purpose for which it was intended.